This is just right! Speaking about surfing in Long Beach… What a beautiful and challenging venue for the symposium and iNARTE’s activities. I say challenging because being so close to the beautiful beaches and multiple attractions in the Long Beach area—who would care about EMC and iNARTE? We were happy to see this dispelled. 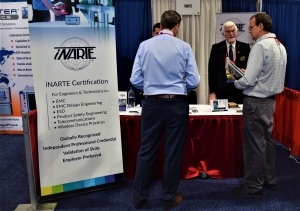 The 2018 IEEE International Symposium on EMC and SI/PI in Long Beach, California, was another step forward in iNARTE’s activities (and successes) at the symposium. No longer does it surprise attendees to see and visit the iNARTE booth in the exhibition area. Traffic was outstanding and the interest in iNARTE is ever-increasing. Traffic included quite a few attendees interested in iNARTE certification. It certainly shows that the continued engagement of iNARTE with the EMCS demonstrated that iNARTE is here to stay. 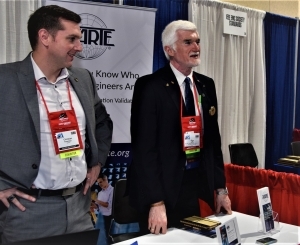 Moreover, the new EMC certification program—the EMC MIL-STD-Specialist, discussed in a the recent “iNARTE iNformer” article, drew great interest from defense and aerospace professionals, particularly. It was great to see that iNARTE serves the needs of the market and the discipline. It was so encouraging to see how many attendees had interest in iNARTE and consider it of value to their career. But moreover, continued interest was demonstrated from well-known and respected training providers, potential global partners, as well as candidate professionals. Interesting proposals and suggestions for new iNARTE certification programs were also discussed in depth—stay tuned for those as they materialize. Have no doubt—all proposals are given serious consideration and development of programs shown to be of interest to a wide community are in the pipeline. “Traditions, traditions. Without our traditions, our lives would be as shaky as… as… as a fiddler on the roof!”- Tevye, in “Fiddler on the Roof”. iNARTE’s activities at the symposium have already become an inseparable, traditional part of the activities. As usual, iNARTE hosted a exam preparation workshop to help candidates prepare for and take the iNARTE certification exams. Seventeen individuals attended the workshop and six sat for various certification exams. We are pleased to report 100 percent success. iNARTE welcomes the new certified professionals. This has now become a “tradition”, since Ottawa, through Washington DC, and now in Long Beach. Success rate has always been 100 percent. The exams are computer generated and evaluated. Global success rate is typically just above 70 percent. So how are symposium attendees so successful? We can attribute this to two key factors (this is not a scientific conclusion): (a) Those who attend the symposium are typically very engaged and are therefore well-prepared for the exam. After all, the exam evaluates your credentials as a practicing engineer or technician. If you practice, you have taken a good step in preparation, and (b) we believe the symposium creates a motivational environment. An additional 22 individuals registered for the exam during the symposium and will take the exam at their convenience, most likely in their own office or home (In the last article we discussed the remote proctoring option). One of the happiest outcomes of this symposium was the fact that of the six individuals who sat for the exam, three were IEEE Young Professionals. Note: For those who may not be familiar with the IEEE Young Professionals, this is the group of IEEE members and volunteers who have graduated from their first professional degree within the past 15 years. It is an international community, whose members are interested in elevating their professional image, expanding their global network, connecting with peers locally and giving back to their community. Since it encompasses all members from recent university graduates to experienced professionals and entrepreneurs, the group is highly diverse in what it has to offer. At this symposium, for the first time iNARTE offered an “incentive” for IEEE Young Professionals to take the exam without fee. Young professionals may apply for certification by contacting our offices and iNARTE will waive the application fee with only the certification fee to be paid only once the individual passes. This offer, incidentally, is still open, and is to be continued. We at iNARTE know that the global body of knowledge on EMC and SI/PI is the IEEE EMC Society. This is where the community learns of the evolutions of technology and hence this is where the future directions and trends of technology lies, and subsequently the need for future iNARTE programs. On behalf of iNARTE I attended several EMCS committee meetings, particularly, the Education Committee, and TC-5, High Power Electromagnetics, and TC-6, Spectrum Engineering. We are certain that these committees and others are where our technology evolves and where the need for demonstrating competent by professionals will be necessary. That is where iNARTE comes in. 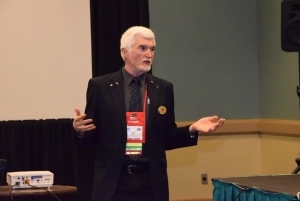 If you see any potential for the development of specialized iNARTE certification programs in support of the field of your committee, please do not hesitate to contact us. 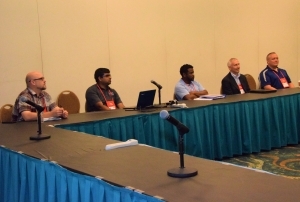 As you see, iNARTE is here to stay and considers its engagement with the EMCS and the EMC+SI/PI Symposium an ongoing engagement, with more programs to be introduced shortly and more steps to be taken to ensure the continued value of the program. iNARTE is working hard to serve the community, seek where we can extend our services, and deliver. Stay tuned for those developments. We plan to report on these as they evolve in the following iNARTE iNformer columns. Click here for more information on iNARTE and our EMC certification programs.